The arrival in my mailbox of WordPress’s Year in Review prompted me to reflect on what has been a very patchy year of blogging. When I first started Focused Moments, back in April 2012, I wrote a new post every day, and kept that up for the best part of a year. But, during 2014, the flow of posts somehow dwindled, and dwindled… 2014 was a year with challenges, but that’s no excuse. There’s no point in promising to do better; you’ve heard it all before. I should just get on and do it; less talk more action! After all, WordPress is a great platform, and some recent enquiries and sales have reminded me that it is also one that does every well in search rankings. So, time to get back on that horse. To start with, I am beginning a project 365. After I completed the usual one-new-image-a-day project back in 2009, I swore I’d never do it again. But this is going to be different. I don’t need motivation to go out and take new images; I can hardly help myself. But I have a massive, sadly disorganised and neglected back catalogue. So I am going to post a ‘this day x years ago’ image every day this year, and it has to be a new edit or an image never before shared. Not only will I be forced to trawl through those forgotten pictures, I will also be forced to log in and do something on Focused Moments. And, once I’m here, I might as well post new stuff too. We’ll see. 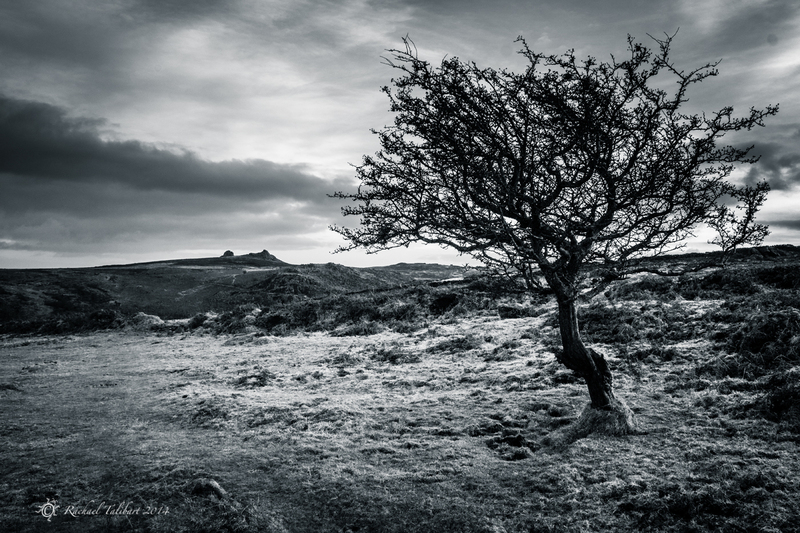 Anyway, here’s image 365/1, from a bracing New Year’s Day 2013 spent exploring Dartmoor National Park. I’d love to spend more time in this atmospheric location. I have a couple of windows of opportunity for exploring more of the UK this year and Dartmoor, with its windy tors and lonely, tortured trees, is definitely on the shortlist. This entry was posted in nature, photography, travel and tagged 365/1, black and white photography, Dartmoor, landscape photography, photography, project 365, Uk by Rachael. Bookmark the permalink. Glad to see you back. Wishing you a great 2015. Note: I had to switch on 3rd party cookies to comment here. I typically leave them off. When I have them off, sometimes I can comment on dedicated sites (those without the .wordress.com address), and other times I can’t. I do plan to keep the 3rd party cookies off, and will comment when it lets me. Looking forward to it Rachael. Happy new year. Happy New Year – looking forward to seeing your images, new and back catalogue! Beautiful image! Happy New Year! Really excited to see you do a 365 project, especially as you’re using existing shots and re-editing. It’s always interesting to see how the story behind shots can almost be re-told with a re-edit. Sometimes. This is a beautiful photo. Makes me think of Wuthering Heights. Superb! I love this – wild, dark and lonely – a bit like the Yorkshire moors where I live. I’ve missed your lovely images on this blog, and am glad you will be back on again. Cheers and happy 2015 to you. Good for you. Great idea! Happy new year, and I love the idea of uncovering forgotten photography gems from the archives. One of my end of year missions was to finish editing and sorting all the photos from the last year that had been piling up and it was fascinating to see what I came across! Good luck and looking forward to seeing your images!